The BBC reports that 33 original photographs taken during the shooting of Tiefland (Lowlands), the last feature film directed by and starring Leni Riefenstahl, Adolf Hitler's favorite filmmaker, go on sale in Shropshire, England, this week. The Tiefland images include those of gypsy children who allegedly had been forced to take part in the shoot – Tiefland was filmed in Spain, Italy, and Germany in the early 1940s – and who are supposed to have died in the gas chambers at Auschwitz. The sale also includes a letter Riefenstahl wrote in 1954, the year the film finally opened in Germany, denying that the children had been sent to Auschwitz. 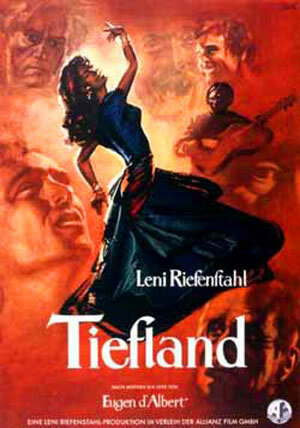 Tiefland was based on Eugen D'Albert's opera which itself was taken from Catalan playwright Ángel Guimerá's Terra Baixa, an indictment against social corruption and tyranny. Jean Cocteau was an ardent admirer of Riefenstahl's film, comparing its imagery to the work of Breughel. As president of the 1954 Cannes Film Festival, Cocteau insisted that Tiefland be screened at the event. July 01, 2005:The Tiburon (Calif.) International Film Festival is open for entries for its 5th annual event scheduled for March 9–17, 2006. As per the festival's rules, submissions are open to all genres of film (fiction, documentary, short, animation, experimental, student, children, sports, music video) from any nation of the world. At the last festival, more than 270 films from 60 countries were screened. The deadline for submissions is: December 1, 2005. Quiz of the Day: Brooke Shields and Christopher Atkins played two teenagers stranded on a desert island in the 1980 film The Blue Lagoon (directed by Randal Kleiser). Who played the two teens in the 1949 British version of that story? Indian-born director Deepa Mehta's controversial Water, an Canadian-Indian co-production, has been selected as the opening gala screening for this year's edition of the Toronto International Film Festival. Water, the story of Hindu child widows in the 1930s, triggered violent protests and death threats during filming in India five years ago. Radical Hindus burned the film's sets in the northern state of Uttar Pradesh, claiming that Water provided a warped view of Indian culture. Shooting was temporarily suspended and later restarted in Sri Lanka. Water completes Mehta's trilogy that includes Earth and Fire. The latter film, which depicts a lesbian relationship between two Indian women, also had its share of controversy when it was temporarily pulled from Indian screens after theaters showing it were attacked. The Toronto film festival, the most important such event in the Americas, runs from September 8–17. GreenCine has announced the winners of the GreenCine Online Film Festival, with the 2005 Narrative Feature Grand Prize going to Red Cockroaches, a futuristic thriller written and directed by Miguel Coyula. The Documentary Competition Grand Prize went to Colum Stapleton's Empire of Juramidam. Rob Nilsson's Security won the Audience Choice Award, while the Eclection Award was given to J.X. Williams's Peep Show (1965-2004). Quiz of the Day: Part I - Who directed the 1953 version of H. G. Wells's War of the Worlds? This director, by the way, was well known as the creator of special effects for dozens of productions. Few remember, however, that he was also a respected veteran cinematographer. Part II - Name (at least) one of the three John Barrymore vehicles in which the War of the Worlds director worked as the Director of Photography. New on DVD: Directed by Anthony Asquithand starring Michael Redgrave, The Browning Version (1951) is considered by many to be one of the best – if not the best – film adaptation of a Terence Rattigan play. In the film, Redgrave plays a somewhat snotty boys' school teacher, with Jean Kentas his unfaithful wife. Directed by Anthony Asquith and starring Michael Redgrave, The Browning Version(1951) is considered by many to be one of the best – if not the best – film adaptation of a Terence Rattigan play. The story revolves around a diffident boys' school teacher (Redgrave) who is out of step with the rapidly changing times, and whose wife has been unfaithful to him. This being a Criterion Collection release, there are the usual extra goodies, including a 1958 interview with Michael Redgrave, and a video interview with Mike Figgis, the director of the 1994 remake that starred Albert Finney. The 7th Taipei Film Festival is currently presenting a Russian cinema retrospective as part of its City-Vision section, which this year focuses on Moscow and St. Petersburg. The Taipei Film Festival runs between June 25-July 9. The Hindustan Times reports that Pakistani actress Meera finds herself in one more imbroglio, this time for having received a peace award from Pakistan Film Censor Board Chairman Ziauddin. Those who don't think that Meera's highly controversial appearance in the Indian film Nazar deserves a peace award have accused Ziauddin of favoritism. Alexei Uchitel's Kosmos Kak Predchustviye / Dreaming of Space has won the Golden St. George award for best film at the Moscow Film Festival. That's Jeanne Moreau, upon receiving the Lifetime Achievement Award from director Nikita Mikhalkovat the 2005 edition of the Moscow Film Festival. Quiz of the Day: During his long and illustrious film career, Michael Redgrave(1908-1985) received only one Academy Award nomination. For which movie? The Los Angeles Film Festival came to a close on Sunday. The previous evening, Mark Banning's Jellysmoke, a low-budget drama about a bipolar man searching for both love and sanity, won the $50,000 filmmaker award, while the documentary prize was given to Beth Bird's Cada uno su granito de arena / Everyone Their Grain of Sand, which depicts the struggles of a Mexican border town under pressure from government and corporate greed. Also on Saturday, actor George Clooney received the festival's first Spirit of Independence Award for his commitment to the production of independent films. Besides starring in highly commercial flicks such as Ocean's Eleven and its sequel, Ocean's Twelve, Clooney acted as producer of the well-received 2002 drama Far from Heaven, and directed the offbeat Confessions of a Dangerous Mind. On hand at the ceremony were Academy Award nominees Don Cheadle(Hotel Rwanda), Virginia Madsen (Sideways), and Shohreh Aghdashloo(House of Sand and Fog), and Emmy winner Allison Janney. The Los Angeles County Museum of Art will present a series of films noirdirected by Robert Siodmak, a German emigré who came to Hollywood in the early 1940s. An irate Tom Cruise, answering a question about links between Steven Spielberg's upcoming War of the Worlds and the Church of Scientology. Cruise then questioned the reporter's credentials. As quoted on ABCnews.com. Quiz of the Day: Which 1940s Robert Siodmak movie revolves around two identical twins, one of whom is a psychopath? Sunday highlights at the Los Angeles Film Festival: Elia Kazan's much-admired Academy Award-winner On the Waterfront (1954), starring Marlon Brando and Eva Marie Saint will be screened at 4:00 pm at the Directors Guild of America Theater 1. Wong Kar-Wai's 2046, starring Tony Leung, Ziyi Zhang, and Gong Li will be shown at 2:30 pm at the Laemmle Sunset 5; and the festival's closing night gala film, Don Roos's Happy Endings, starring Maggie Gyllenhaal and Laura Dern, will be screened at 7:00 pm at Mann's National Theater. Seven films addressing political and cultural issues in West Asia and North Africa are currently being screened at the SÁ£o Paulo Cultural Center. Among the selected films, some of which have not been released in Brazil, are Robert Greenwald's Uncovered: The War on Iraq, Gillo Pontecorvo's 1966 classic La Battaglia di Algeri / The Battle of Algiers, and Selves and Others: A Portrait of Edward Said, a documentary about the last days of Palestinian intellectual Edward Said, who died in 2003. The festival runs until July 3. Quiz of the Day: On the Waterfront was nominated for how many Academy Awards in the acting categories? A screening of Robbing Peter, which was nominated for four Independent Spirit Awards, followed by a discussion and Q&A session with director and writer Mario de la Vega, and producers T. Todd Flinchum and Lisa Y. Garibay at 4:00 pm at the Directors Guild of America Theater 1. Also, at 7:30 pm at the Directors Guild of America Theater 1, a screening of De battre mon coeur s'est arrÁªté / The Beat That My Heart Skippedwith director Jacques Audiard and actor Romain Duris in attendance [Note: Duris was a no show]; and at 5:00 pm at the Directors Guild of America Theater 2, director Eric Lahey will be present for the screening of his documentary The Century Plaza. In July, the Canadian Film Institute in Ottawa will present the 1st Southeastern Europe Film Festival, showcasing the national cinemas of Greece, Turkey, Bosnia-Herzegovina, Bulgaria, Serbia-Montenegro, and Romania. Among the films being screened are Constantinos Haralambous's Love at 16, Dino Mustafic's Remake, and Srdjan Karanovic's Loving Glances. The festival runs between July 9-14. Academy of Motion Picture Arts and Sciences President Frank Pierson, explaining why the Academy board of governors has declined a request to add a new Academy Award category for stunt coordinators. Mean Girls womanand De Beers LV gala attendee Lindsay Lohan, referring to the controversy surrounding the opening of a De Beers diamond store in New York City. The mining company De Beers has been accused of forcing the dislocation of Bushman tribes from their natural habitat in Botswana and of trading in “blood diamonds,” precious stones that have been used to pay for civil wars in various African nations. All that in addition to a conviction in U.S. courts for price-fixing. As quoted in Reuters. At 8:30 pm, at the Director's Guild of America Theater 2, four-time Academy Award-nominee Robert Towne will show clips and discuss his relationship with Los Angeles “as a character and a location in his work.” Film critic Elvis Mitchell will act as moderator. Also, director Danny Leiner and producer Leslie Urdang will attend the 5:00 pm Laemmle Sunset 5 Theater 1 screening of The Great New Wonderful, which stars Maggie Gyllenhaal. And finally, director Eran Riklis will be on hand for the 7:00 pm screening of The Syrian Bride at the Laemmle Sunset 5 Theatre 2, while director Alejo Taubewill attend the 9:45 pm screening of Una de dos / One Out of Two also at the Laemmle Sunset 5 Theatre 2. Today at the Los Angeles Film Festival: A screening of Miranda July's Me and You and Everyone We Know. July and actor John Hawkes will attend the 7:00 pm screening at the Directors Guild of America Theater 1. Also today, Mark Banning's Jellysmoke will be screened at 5:15 pm, and Eric Lahey's documentary The Century Plaza at 7:30 pm, both at the Directors Guild of America Theater 2. The second screening of James Franco's dark comedy The Ape is scheduled for 4:30 pm at the Laemmle Sunset 5. That's Tom Laughlin, the star-writer-director-producer of the surprise 1971 box-office hit Billy Jack, as quoted in The New York Times. Laughlin, along with his wife and Billy Jack co-star Delores Taylor, have plans for a new movie that will tackle drug abuse, Christian zealotry in American politics, and the war in Iraq. Mitsuhiro Mihara's Mura no shashinshuu / The Village Album has won the Best Film Award at the Shanghai International Film Festival. Quiz of the Day: Which frequent James Cagney co-star has a supporting role in the second Billy Jack sequel, Billy Jack Goes to Washington (1977)? Quiz of the Day: In a Hollywood movie set in Morocco, a woman leaves a wealthy suitor to follow the man she loves – a legionnaire, no less – through the desert. What is the name of the movie? And who's the woman who loves too much, though, considering the circumstances, not too wisely? James Woods Twitter Lawsuit: Slander Case or Social Media Freedom of Speech Attack?